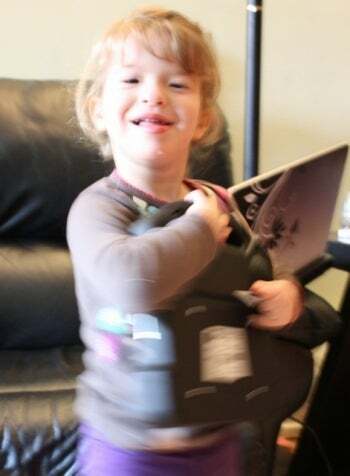 Image of Maya Nieder, coutersy of Dana Nieder's blog. 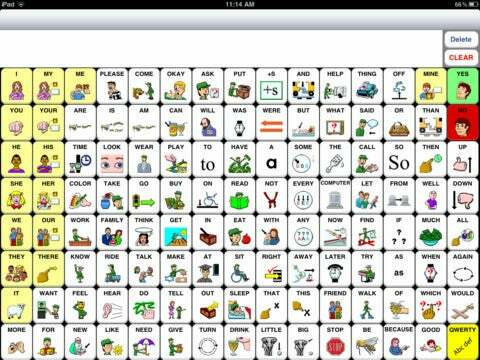 Semantic Compaction Systems is suing a small augmentative and alternative communication (AAC) iPad app company called Speak for Yourself, alleging patent infringement. Another day, another lawsuit--right? Well, Slashdot points to a blog post by blogger Dana Nieder at her family blog on how this lawsuit is actually affecting real people. "When Maya was two and a half we introduced her to the iPad, and we've danced with AAC (augmentative and alternative communication) ever since. We experimented with a few communication apps, but nothing was a perfect fit. 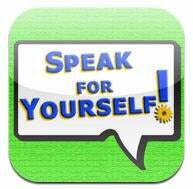 After an extensive search for the perfect app, we found it: Speak for Yourself. Simple and brilliant, we saw that it had the potential to serve Maya into adulthood, but was also simple enough for her to start using immediately. And she liked it. And it worked. And I started to have little flashes of the future, in which she could rapidly tap out phrases and ideas and tell me more and more of the secret thoughts that fill her head—the ones that I'm hungry to hear and she's dying to share but her uncooperative mouth just can't get out. My kid is learning how to "talk." It's breathtaking." So this app is basically life-changing for a little girl who lives in the Bronx. But now the company who makes the $300 app is being sued by Semantic Compaction Systems and Prentke Romich Company, both of which are large companies and, as Nieder points out, "big names" in the AAC world. According to the complaint, Speak for Yourself is infringing upon two patents related to dynamic keyboards and changing keys on a keyboard in the context of AAC software. Speak for Yourself's iPad app, when used on an iPad, allegedly infringes on patents no. 5,748,177 and 5,920,303. And this is not a "ridiculous lawsuit" story--the lawsuit and the patents, as TechDirt points out, appear to be pretty solid. But that doesn't really matter to the Nieder family. "I'm going to be honest: I don't know about patents and infringement, and I'm not going to get into debates about the legal merits of the case, because that's a conversation in which I would quickly drown. And if you were in my shoes, you would see that the legal part isn't the part that matters," Nieder writes. Nieder's point is this: if the large companies successfully sue Speak for Yourself into oblivion, the app will likely disappear. And instead of developing a similar app--Nieder has spoken with representatives from Prentke Romich Company, and they have already told her there is no plan get into app development--the companies will likely push their own communication devices, which go for as much as $9000 and are "too big (both literally and figuratively)" for Nieder's daughter. So, in short, this is how patent lawsuits affect real people. This is definitely a case in which the lawsuit is hindering--not helping--innovation, since the larger companies who have been done "irreparable damage" reportedly have no interest in creating an affordable alternative. "Interestingly, PRC's mission statement starts with 'We Believe Everyone Deserves A Voice.'" Nieder writes, "Perhaps 'We Believe Everyone Who Purchases Our Devices Deserves A Voice' or 'We Believe Everyone Except Those Needing An Affordable App Deserves a Voice' might be more appropriate alternatives."